An in-depth look at the how the 7 primary emotions are expressed by the 9 Enneagram Types, 27 Tritypes, and 3 Instinctual Types, revealing critical clues as to what Type is dominant. How: Zoom (free download, available here) - Make sure you have a camera on your computer! Recorded: All breakout groups are not recorded. All teaching material recorded unless otherwise specified. Recording available 1 week after the course, for a limited time. An incredible tool to help support clients, family members and friends that are seeking supportive feedback in the process of personal growth. Click here to register now and reserve your spot! Master Class - Tritypes: An advanced course for those that have a working knowledge of the Enneagram Types and wish to learn deeper dimensions of type as seen through the lens the 27 Tritypes. Available for purchase here. 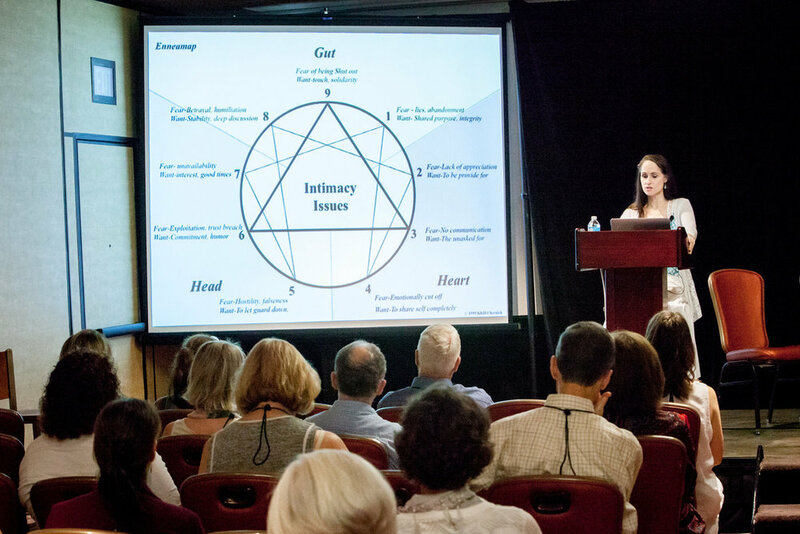 Instinctual Types and Subtypes: An advanced course on the 3 Instinctual Types: self-preserving, social and sexual (intimate) and 27 Subtypes that govern the manner in which we express our Enneagram Types and Tritypes. Tips on Typing: Accurately typing one's self and others is an important step in one's journey of self-discovery with the Enneagram. An introduction to the key features of a 12 point system of reference that helps with identifying what is important to consider when typing yourself and others. Appropriate for the beginner and advanced student. Master Class- Enneastyle Questionnaire: An advanced course on how to evaluate and interpret the responses, words, pictures and phrases used on the tests and the Enneastyle Questionnaire. Appropriate for experienced Enneagram teachers, coaches, therapists, spiritual directors and enthusiasts that wish to learn how to type and guide others using the Enneagram of Personality System. Master Class - In-depth Inquiry Process: An advanced course on how to guide others and coach them through the in-depth inquiry process. This course includes how to track, tag, assess, interpret and neutralize painful and crystalized emotional memories. These memories can be seen and heard in the external clues displayed in one's body language, physical gestures, facial expressions, tone, and speech patterns. These external expressions reveal the deeper internal emotional states that need the opportunity to be expressed, tagged and neutralized to break up rigid patterns within the defense strategy. Appropriate for experienced Enneagram teachers, coaches, therapists, spiritual directors and enthusiasts that wish to learn how to type and guide others using the Enneagram of Personality System. Katherine does both personal and business coaching. Find out more about how Katherine can help you in business by going here. "Katherine has the ability to synthesize material from a variety of sources and to organize it in a way that offers cohesion and insight.... she has made a point to study with everyone who has taught this topic, and made powerful contributions with her own research on the inner world of the types, Tritypes and subtypes...."
Turn personal struggles into opportunities for life-enhancing personal empowerment. Katherine is a personality expert. She has been working as an Enneagram transformational author, researcher, teacher, trainer and coach since 1985 and has an integrated and holistic view of the Enneagram. Her ‘In-depth Inquiry Process’ helps you discover new ways of working with old problems. Katherine’s vast knowledge of many systems allows her to effortlessly track your words, expressions, tone, and body language in a way that will help you identify what is at the root of your current issues. With this insight, you can transform relationships, achieve your potential and understand more about your own unique path to wholeness. Most importantly, Katherine works to quickly and radically deepen your understanding of yourself and others, which empowers you to develop the critical self-awareness needed to live a more meaningful and fulfilling life. Learn more about Katherine's approach to coaching. I decided to work with Katherine without a specific issue or concern in mind, except to advance my self-awareness and understanding my enneagram tritype. In our first meeting Katherine helped me identify and clarify a self-limiting belief and a constellation of defence strategies organized around this belief. I have gained a deeper insight into how this belief system plays out, how to identify it and most importantly actionable steps to notice this previously unconscious mode of operating. I also gained a deeper understanding of how the tritype functions as a part of this pattern. If you are looking to up your game in terms of self-awareness or wondering just how much further you take your knowledge of the enneagram, fasten your seat belt and sign up for session with with Katherine. I will continue to offer the 1 hour mini typing interview for $100. 1 hour Tritype Session ($100 special) with 1 hour Coaching Session: $175 for a 2 hour session of only $275.00. I'd love to support you on your journey of discovery. If you feel the time is right, just email me at info@katherinefauvre.com and mention the Special. To be available to international clients I schedule appointments Monday through Friday from 12:00 (noon) to 7:00 pm Pacific Time. Below is a playlist of "Enneagram" Hangouts with Ben & Jonathan in the last year. View all Google Hangouts, videos and interviews here. What Enneagram Type was Hitler? Click for more blog posts!